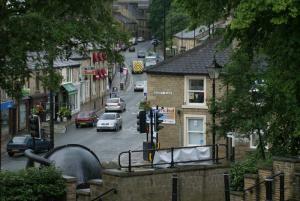 Welcome, we raise funds and we do lots of community work in Ramsbottom. We link with our local High School, we work with local PTA groups & the local business group. Would you like to join us? 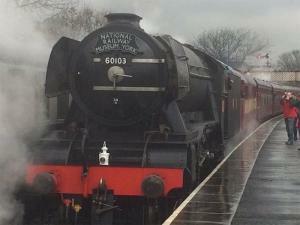 The Flying Scotsman passes through Ramsbottom - photo by kind permission of Joel Yates. This is some information about Ramsbottom Rotary.Trevor will update this soon. Annual Duck Race. Information to follow soon. There are a number of options for buying Ducks. 1. 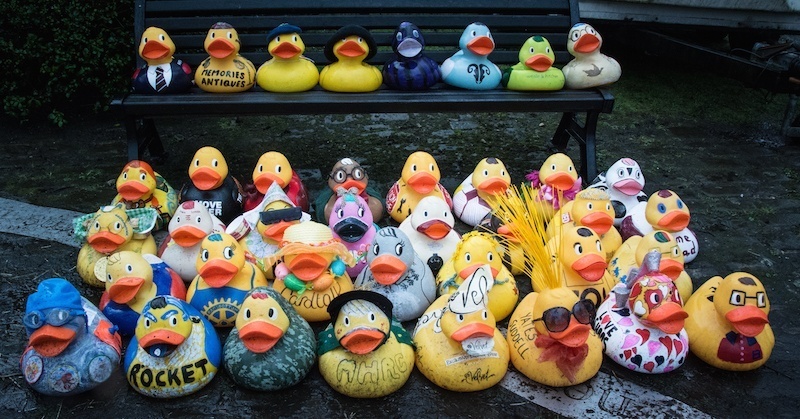 If you have a giant Giant Duck from previous years you can re-enter your Duck for £10, or you may buy a giant Duck for £25, which you can decorate and bring along the Duck on the day. 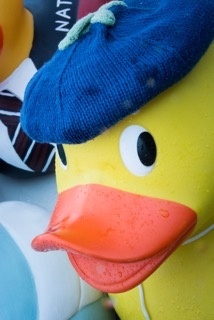 The Giant Duck Race is at 1.00pm. We like the Giant Ducks well in advance as they make excellent photography. We can deliver Giant Ducks locally. 2. Small Ducks are for sale on line for £2, and are also availble to buy on the day. Buying on line, you will receive a number of a duck, which will be entered in one of the races on the day, which is Sunday 27th May. We will notify you if you win a prize. 3. You can choose to buy up to 5 small ducks in one transaction. 4. Kiddies Boat Race tickets are £2 each & limited to 50 boats. Use the drop down arrow to select the Duck(s) you want (or the re-entry option) or the Kiddies Boat Race tickets, and then pay for it/them using the Buy Now button - where you can use your PayPal account (if you have one) or you can use your debit/credit card if you prefer. Select the duck(s) required & then click on the "Buy Now" button. Buy here, scroll to the one you wish to purchase, first there is the Giant Duck, then below that small ducks, then the tickets for the Kiddies Boat Race. Sponsors - would you like to help a world wide charity which changes lives around the world. Ramsbottom Rotary Duck Race is just one tiny cog in the world wide wheel, but it all makes the wheel go around. Want to help, we would love to have you on board. We need help with IT, with this website, with social media, with publicity. If you have a hour to spare please get in touch. Rotary membership is changing, there are no obligations any more, do as little or as much as you wish. One thing for sure you will make new friends, you will be able to do things or organise things. There is lots going on in Rotary. If you are interested in helping in any way, please click Trevor Hoyle and send me an email. Would you like to donate to Rotary charities? Unlike all the big charities all our monies raised goes to good causes. We also are involved with Community Activities and help local, national & international charities. So your donation will be going to were it is needed. If so, use the "Donate" button below. You can use your PayPal Account or debit or credit cards. Congratualtions to Amelia, coming in third place in the Regional Finals, which means Amelia is in the top twenty or so of the Young Chefs in the country. Amelia at the District Finals with her Father. Amelia at the District Final with her personnel assistant - her Dad. 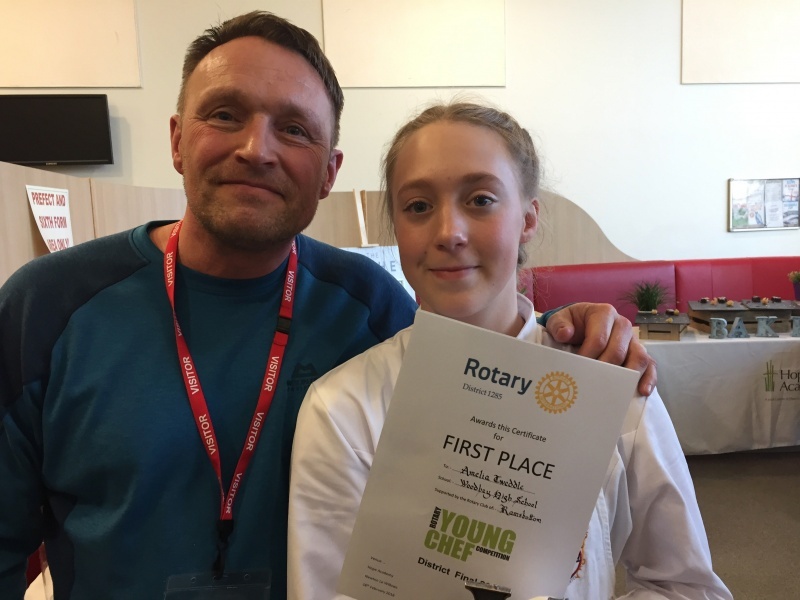 Amelia Tweddle is our Ramsbottom Rotary Young Chef from Woodhey High School, who came from 120 competitors at Woodhey Highschool through to the District Finals and is now on the way to the Regional Finals on the 17th of March. We have recently completed a record breaking 120 entrants taking part this year. 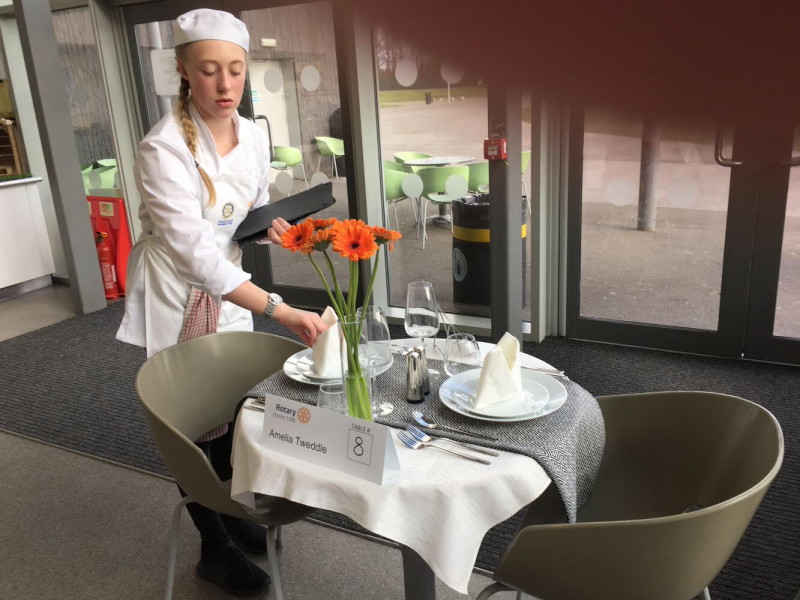 Claire Gallie Head of Food Technology was amazed at the number of pupils taking part, said it's a wonderful experience which Rotary bring to Woodhey High school. Last Year the School Winner - Rebecca Wilkinson went onto win the District final, then the Regional final and came third in the National final. The judges at the National Final said her Smoked Haddock Soufflé was outstanding. Mrs Claire Gallie, the Head of Food Technology, said the interest is growing year on year, pupils are showing a greater interest in food and cooking, the quality and variety is outstanding for year nine pupils. The entrants had to choose a two course healthy meal for two people, provide their own recipes & ingredients, cook and present the food on their “ dressed” table all in one and half hours. Two winners were chosen and one person in reserve. Will all be mentored by local restuarants in preparation for the next stage. The story begins in 2002, in a lopsided shed in the Scottish Highlands, where Magnus MacFarlane-Barrow started a small charity which grew into a massive organisation helping millions of children fulfil the simple ambition of “having enough food to eat & be able to go to school”. Mary’s Meals now feeds a nutritious meal to more than 1.25 million children every school day in 13 of the poorest parts of the world, including India, Thailand, Burma, Lebanon, Haiti, Ecuador and 7 African countries. Wherever possible the meal is made using local ingredients produced by small-holder farmers, thereby supporting the local community. Being educated and fed enables children to lift themselves, their families and their communities out of poverty. Between now and the 31st December every donation to Mary’s Meal’s “Double the Love” appeal will be matched by a supporter-led match-funding campaign (up to £1.9 million), so for every £13.90 donated two children will be fed and educated for a whole school year, the very best present you could give. Go to www.marysmeals.org.uk to make some hungry children in the world very happy. Many children receiving Mary’s Meals do not have basic learning tools such as pencils & notepads. The Backpack Project helps the children get the most out of their learning by donating a backpack full of the things they need. For many children, a Mary’s Meals backpack will be the first gift they have ever received. 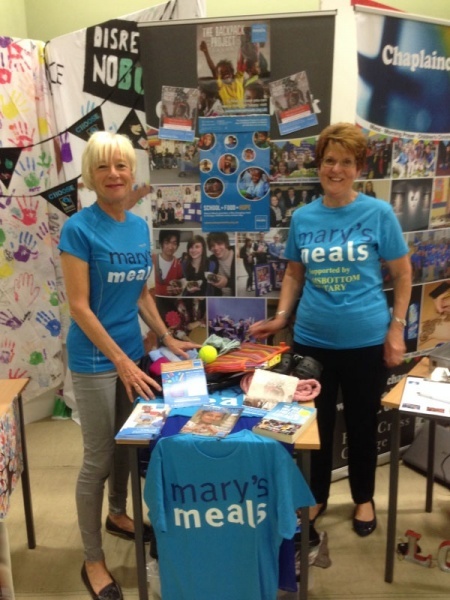 Janice & Hilary began their “Bags of Love” project this summer under the Rotary Ramsbottom umbrella, and have been asking schools and organisations to provide backpack items, new or good condition pre-owned. We have 65 completed backpacks ready for collection by Mary’s Meals and many more which are almost complete. It’s a great way to recycle school bags, uniforms, sandals, PE kits, towels and spoons. Other items required include A4 lined and unlined notepads, pens, pencils, coloured pencils, sharpeners, erasers, pencil cases, rulers, soap, toothbrushes and toothpaste. They would really appreciate it if you or any school, organisation or club you know could contribute. Financial donations are also very gratefully received to purchase those “hard-to-come-by” items such as sandals and boys’ shorts. A brief presentation for younger children or a more detailed one for those interested in the fuller benefits of the project can be given. Current participants include Holcolme Brook Primary School, 38th Rossendale (Open) Scouts, Speakeasy, Holy Cross College, Ramsbottom Rotary, family and friends. Janice & Hilary are delighted at the enormous response and good-will they have encountered and know that the smiles on the faces of the children participating will be multiplied many times on those receiving these “Bags of Love”. If anyone wants to help with this worthwhile project, has items to donate, or is part of a group which may want to get involved, please contact Ramsbottom Rotary or email Janice Conley at : janiceconley21@gmail.com. The Red Hall Hotel, Manchester Road, Walmersley, BURY.